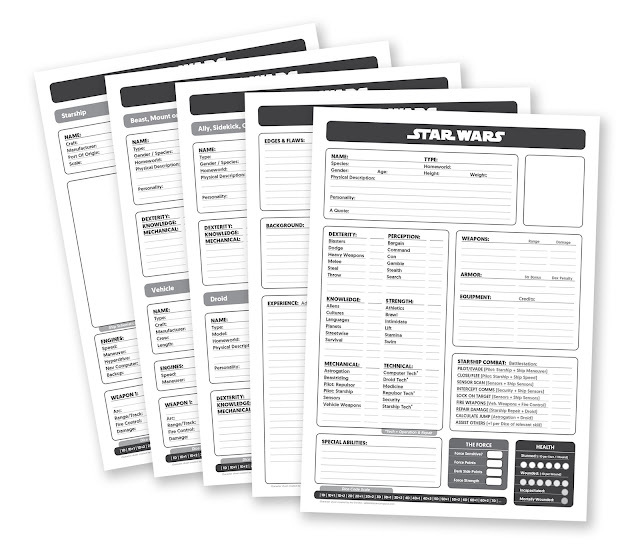 the latest version of my 5 page Star Wars D6 Character Sheets. and one for your Starship. Hope you dig, and lemme know if there's any typos or stuff I missed. If you can translate it for me I can set it up. There will be a form-fillable PDF soon. Perfect, i will do it. Thank. What happened to to the Diplomacy skill? Other than that, this is a great sheet. Also, I looked over your Star Wars document, and noticed a few minor things that looked a little off, like weird justification on the tables, and unfinished sections. Was this a work in progress? I'm digging this. I found your site after searching for a SW D6 character sheet. I like the work you've done. I, myself, have been working on a version of the game too. It's mostly taking what I like of the FFG system and the WEG system and melding the two. I'd love to be able to chat about what you are doing sometime. My group and I have played for almost six sessions using your PDFs as a base - thank you so much! You really helped condense a somewhat dense ruleset down into a few very manageable reference sheets. Especially loved the Edges and Burdens which are not present in any of the base rules I have been able to find. Keep up the great work!